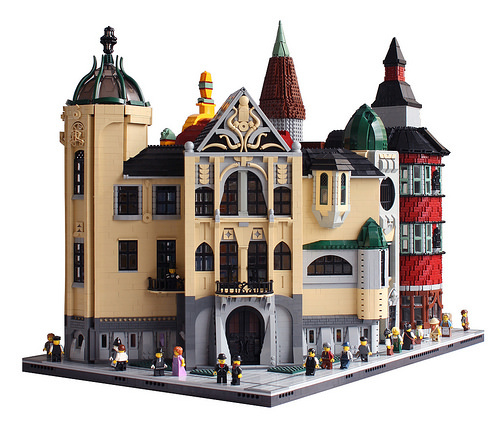 Taking a break from creating stunning LEGO characters, Finnish builder Eero Okkonen has assembled an equally-stunning, 360-degree city block filled with gorgeous early-1900s modular buildings. 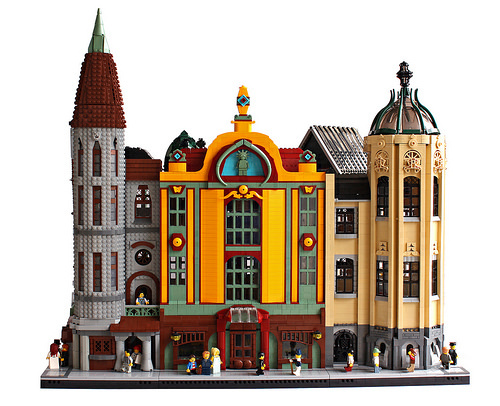 Each of the four buildings (“Grand Hotel Masaryk”, “Olofslott”, “Louhi” and “House of the Brick Wall”) has its own unique style and charm. But the block as a whole still feels very cohesive. Eero says he began sketching the design for his creation after a train ride from Helsinki to Tampere. His design incorporates Finnish Jugendstil (Art Nouveau) elements and tries to avoid 90-degree angles wherever possible. Each of the buildings pulls inspiration from real-world buildings such as the Hotel Europa in Prague and the Tampere Cathedral in Finland. Eero also borrowed from architectural philosophies like Camillo Sitte’s urban planning theories and Finnish national romantic architecture. There are a ton of interesting details to observe if you get close up. 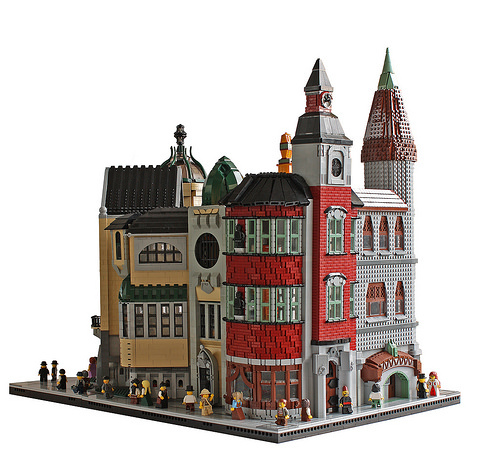 From rowboats and rope bridges to dinosaur tails and butterflies, Eero has used a wide variety of LEGO pieces to construct his colorful city block, and the results speak for themselves. For more photos and an in-depth article written by the builder himself, visit Eero’s blog.